Norway’s minority government lost the last of its two support parties on Wednesday, when the Christian Democrats followed the Liberals’ lead and pulled out of negotiations over the state budget for next year. Christian Democrats leader Knut Arild Hareide blamed the government’s ultimatum over limited fuel tax hikes, which he claimed would leave car owners winning at the expense of the climate. “We have always been constructive,” Hareide claimed after the meeting with his party faithful at the Parliament. 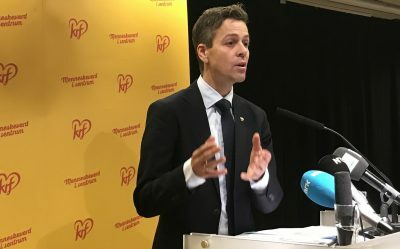 He went on to suggest it was destructive for the government led by Prime Minister Erna Solberg of the Conservatives and Finance Minister Siv Jensen of the Progress Party to insist that their proposed changes in a package of vehicle taxes were non-negotiable. “We would never have presented such an ultimatum,” Hareide told reporters right after his party’s emergency meeting ended with a unanimous vote that the Christian Democrats could no longer go forward with budget negotiations. Hareide acknowledged that climate measures in the budget had led to “demanding” negotiations over the past several weeks. Other measures offered in exchange for the government’s minimal fuel tax hikes were not enough to satisfy either his party’s or the Liberals’ goals for reducing carbon emissions. (2) The Conservatives’ and Progress Party’s minority coalition dissolves, leaving Labour to take over or Solberg continuing as prime minister alone. It will be extremely difficult for the Progress Party to waiver from its firm position against raising taxes, and it may opt to leave the government. (3) The current government continues as a minority coalition, forced to seek issue-by-issue support until its term ends in September.